Details are rapidly emerging from the massacre in Sutherland Springs church—a shooting being called the deadliest shooting in the history of Texas. Sutherland Springs, TX – A mass shooting at a Baptist church in Sutherland Springs, Texas left dozens dead and many more injured after a gunman dressed in combat gear entered the small rural church and began gunning down attendees – including numerous women and children. The New York Times identified the shooter as Devin P. Kelley, a former Air Force veteran who was court martialed in 2014 and sentenced to a year in military prison for assaulting his spouse and child. He was reduced in rank and released with a bad-conduct discharge in 2014. Authorities said 26 people were killed in the Sunday rampage… The dead included eight relatives spanning three generations in a single family. While officials had said the victims ranged in age from 5 to 72, one family said a 1-year-old girl was also killed, part of the eight family members slain in the attack. The attack came to an end when a heroic citizen driving past the church noticed the gunman exiting the church exchanging gunfire with a local citizen and grabbed his own rifle. The two heroes then gave chase to the gunman who fled in an SUV. The shooter crashed during the high-speed pursuit, and authorities say it’s unknown at this point whether he took his own life, or died from being struck during the gunfight with the local men. Additionally, the tragedy was compounded by the fact that “there are no medical facilities” in the extremely rural town of Sutherland Springs – and the closest medical facility being nearly 30 miles away, according to KENS5. Local news reports indicate that perhaps half of the small church’s congregation was killed in the attack, as only 40-50 people generally attend services on any given day. Another woman told CNN that the church was “your quintessential country church” in small town rural America, as the Sutherland Springs community numbers only hundreds – which makes it likely that almost everyone in the town will know people injured or killed in the attack. 1. The shooter’s motives are currently unknown. Texas Gov. Greg Abbott (R) suggested Monday morning that “there may have been a reason why this particular location was targeted,” although he did not give specifics. “I don’t think this is a random act of shooting, a randomly chosen location, but obviously someone who is very deranged,” Abbott said in an interview on the “Today” show. In addition to trying to determine a motive, authorities are also investigating how the attacker obtained his weapon, as Kelley had sought a license to carry a gun in Texas but was rejected, according to Abbott. As the shooter exited the church he was met by gunfire from an unidentified citizen with a rifle. At this point, another local, Johnnie Langendorff, was driving his truck to his girlfriend’s house nearby when as he drove past the church he noticed a man clad in all black with a pistol exchanging gunfire with another man holding a rifle. The gunman then attempted to flee in an SUV. The man Langendorff saw exchanging gunfire with the church shooter approached him. The two men were complete strangers. The two men then pursued the suspected shooter in Langendorff’s truck, with speeds during the pursuit topping out at upwards of 95 miles per hour, as the men narrated the entire chase to law enforcement. The killer’s vehicle abruptly veered off the roadway and crashed into a ditch about 11 miles north of the church. Langerdorff then pulled his own truck within 25 yards of the suspect’s vehicle. “The gentleman that was with me got out, rested his rifle on my hood and kept it aimed at him, telling him to get out get out. There was no movement, there was none of that. I just know his brake lights were going on and off, so he might have been unconscious from the crash or something like that, I’m not sure,” he said. The shooter, identified as Devin P. Kelley, is a former Air Force veteran who was court martialed in 2014 and sentenced to a year in military prison for assaulting his spouse and child. He was reduced in rank and released with a bad-conduct discharge in 2014. Kelley was from nearby New Braunfels, Texas, according to his social media pages. 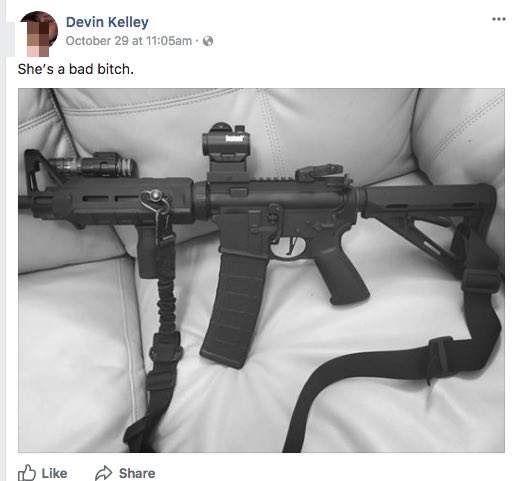 The weapon used in the massacre was similar to the one Kelley posted on Facebook, but authorities have not officially confirmed it was the same weapon used in the mass shooting. Pastor Frank Pomeroy heads the First Baptist Church in Sutherland Springs, Texas, where Devin Kelley massacred 26 people. Pomeroy has been the long-time pastor of the church. Pomeroy’s wife of 30 years, Sherri Newman Pomeroy, posted a photo of their daughter hours after she was identified as one of the deceased. 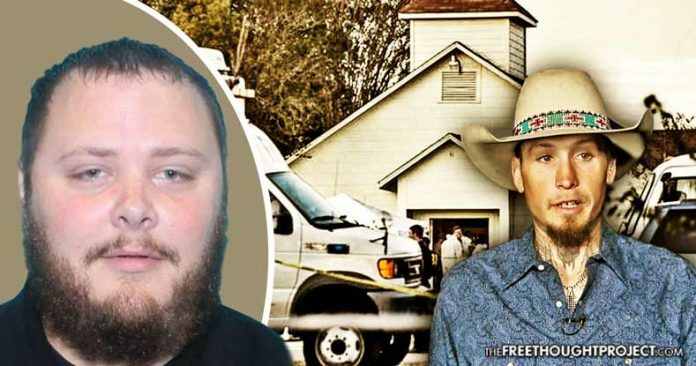 Although typically at the church for Sunday services, Pomeroy told ABC that he was in Oklahoma when the shooting took place. Many of the victims of this brutal attack are his close friends of his, according to Pomeroy. Although an extremely small church, The First Baptist Church of Sutherland Springs operates a YouTube channel and podcast where they post videos and audio of worship services and events. Pomeroy is shown in many of the videos speaking and giving sermons from the pulpit to the members about issues in our society and how to involve God in their lives. With that being the case, there is distinct possibility that the entire massacre was recorded — although due to Pomeroy not being in town during the massacre — it may not have been. The most recent video uploaded to the church’s YouTube channel was on October 29, the sermon from the week before. Pomeroy also hosts a weekly podcast, which he began in July of 2005, in which he discusses issues in society and the applicability of Bible verses – with the most recent episode being uploaded October 15. The FBI, U.S. Bureau of Alcohol, Tobacco, Firearms and Explosives and local authorities are assisting in the investigation. Thus far, no motive has been publicly identified, but authorities have said there’s currently no evidence to suggest that Kelley was part of a terrorist organization. The church shooting comes a little over one month after the most deadly mass shooting in American history, in which a gunman in Las Vegas opened fire on thousands of people attending a music festival from his Mandalay Bay hotel room. Fifty-eight people died in the brutal attack, and over 500 others were injured, yet authorities have still not released a motive or even a still photo of the suspect in that attack – raising more questions than answers.